Xconomy: Dyn's New CEO on Business and Security in the Age of "Volatile Internet"
Tumultuous times these are. Amid mounting security threats, cyber attacks, and fallout from the U.S. presidential election, someone’s got to keep an eye on the Internet infrastructure that the world’s businesses run on. One of those players is Dyn, a Manchester, NH-based provider of DNS (Domain Name System) services. But Dyn is in transition itself. The company raised $50 million in funding in May, and co-founder and former CEO Jeremy Hitchcock stepped down. He was replaced first by interim CEO Jim Baum (the company’s executive chairman) and then by Colin Doherty last month. Dyn was hit by a distributed denial-of-service (DDoS) attack in Doherty’s first month. The attack brought down popular services like Twitter, Netflix, and Amazon Web Services, raising the specter of even larger attacks down the road. 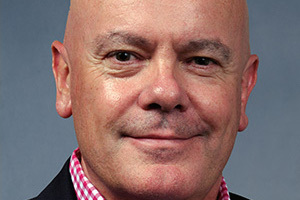 Doherty (pictured above) was previously the CEO of BTI Systems, a networking software company that was bought by Juniper Networks earlier this year. Before that, he was CEO of network security firm Arbor Networks. Xconomy: What’s the broader significance of last month’s attack for Internet security? And what are you (and others) doing to deal with situations like this in the future? Colin Doherty: The attack on Dyn in October opened up a really important conversation about the volatility and security of the Internet. It’s made people face the vulnerabilities in the security of IoT devices that need to be addressed. It has also started a dialogue in the Internet infrastructure community about what the future of the Internet looks like. DDoS attacks are on the rise, and as we’ve seen over the past few months, they’re growing in size, too. But they are only one cause of volatility. The more companies rely on the Internet as part of their business network, the more they need to have an ability to manage that performance. We want to be viewed as that trusted advisor who can help companies monitor and control a complex and volatile Internet. X: Why is Dyn a fit for you, and how did your move come about? CD: For the last 10 years, I’ve worked for private companies, scaling and growing companies in the data center and software security space. I’m a growth guy and it aligns with Dyn’s next chapter. Dyn has a tremendous opportunity for growth and has already had great success over the years. 2016 has been the perfect example of that growth, with the $50 million in Series B funding back in May. Dyn has a lot of factors working in its favor. The employees for starters are the most important. There is such great institutional knowledge and energy among them. Additionally, we have a fantastic customer base, with some really meaningful customers in the enterprise space that Dyn can grow with. A company with this kind of growth potential felt like a natural fit for me. X: What lessons do you bring from Arbor Networks and BTI? CD: I’ve been fortunate enough to gain great market experience in the enterprise tech space that will really help me serve Dyn well. When it comes to sales, I had success restructuring the sales force at BTI Systems. I brought in a new global SVP of sales and refocused the sales effort to go deeper into fewer markets; we had spread ourselves too thin. In Dyn, we have an opportunity as a [software-as-a-service] model to sell through channels and partners to gain better global customers and increase market penetration—this activity is already underway. Our core DNS capabilities align closely with cloud security solutions and our stated direction for our Internet Performance Management (IPM) solutions. In my view, the Dyn product portfolio is uniquely well positioned to address the hybrid cloud transformation that is accelerating in the enterprise markets today. X: What kinds of strategic shifts or emphasis will you make at Dyn? What are the big opportunities and challenges ahead? CD: There are so many market opportunities Dyn can take advantage of. For example, the trend towards hybrid cloud is a huge one for Dyn. The way Dyn can monitor, control, and optimize infrastructure and applications over the Internet and in the cloud is where Dyn really shines. Dyn sits right at the intersection of this transformation and shift taking place in the market, so the opportunity is ours. I’ll also continue to focus on the IPM space. Dyn really took a leadership position in the IPM segment this year and I’d like to see the company scale and take an even larger leadership role as we move forward. One of the challenges, but also opportunities, in a company like Dyn is harnessing all the enthusiasm into areas we can execute against. There are so many opportunities and we really need to focus and be disciplined on our direction and identify what we can act on. I’d also like to increase our customer capture rate, increase our software suite of services to those install-base customers, and attract new ones. We have different ways we can go to market, whether it be through channel partners or through system integrators. We’re in the process of 2017 planning and looking at how we scale our business and access more customers through indirect methodology, as opposed to just a direct sales force model.